DC7B N4887C has retained its original registration since it was first delivered to Delta in November 1957. Douglas started work on the DC7 in 1951 after American Airlines requested a competitor to Trans World Airlines' impending introduction of the Lockheed Super Constellation on its transcontinental routes. Based on its highly successful DC6, the Seven was to become Douglas's last propeller airliner but, like the Constellation, it was to find itself overtaken in the race into the jet age. Using the same wing that had first appeared on the DC4, the DC7 introduced a new fuselage 40in (1.02m) longer than the DC6B which allowed for an extra row of seats and a total of up to 95 passengers to be carried. But the major change was the switch to Wright R-3350 turbo-compound engines, compared with the DC6's piston radials. This gave a big boost in performance and - coupled with greater fuel capacity - allowed non-stop transcontinental travel. The DC7 first flew on May 18, 1953 and American became the first of four US airlines to put it into service on domestic routes in November. It was fitting the carrier was first with the type as the project had only gone ahead when the company told a reluctant Douglas it would buy 25 for $40 million - paying for the development costs. After 105 of the basic model had been built for American (34), United (57), Delta (10) and National (4) production switched to the DC7B. This was externally identical to the basic model, apart from longer nacelles containing extra fuel, and 112 were built. Pan Am used its fleet of seven to start the first non-stop London to New York service on June 1955. But the B model was not able to make the crossing in all weathers Douglas developed the ultimate DC7C to create a truly Trans-Atlantic airliner. To fit in the extra fuel needed a major redesign was required. The wing span was increased by 10ft (3.05m) by adding a plug between the fuselage and inner engines and the fuselage was extended by 42in (1.1m). The main change was however the uprated Curtiss-Wright 3,400 hp Turbo Compound EA1 engines which allowed an increase in weight and enabled 105 passengers to be carried. The first of 121 7Cs flew on December 20, 1955 and entered service with Pan Am in June 1956 to wide acclaim. It shook up the London-New York route to such an extent that BOAC was forced to buy it rather than wait for its Britannias. SAS introduced an over the North Pole service from Europe to the Far east in 1957. 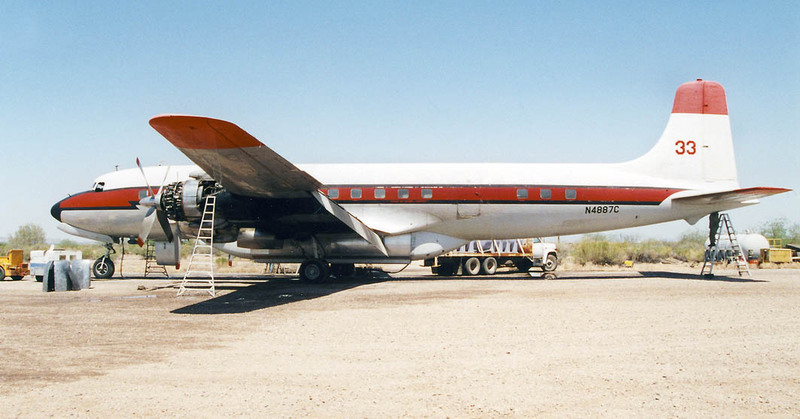 When the jet age started to squeeze the DC7 from frontline airline service Douglas converted many to freighters as the DC7F and the type soldiered on in limited passenger, freight and charter operation in the USA and elsewhere until the mid 1980s. Total production of all variants was 338, with one example restored to flying condition in Florida in 2010.